A couple of weeks ago Facebook rolled out some subtle changes. Although it looks the same (apart from the new promote a post button, we’ll get to that later) these changes effect every single person who has a ‘Page’ on Facebook and who uses it to communicate with their fan base. Facebook has changed what shows up in peoples news feed. Facebook is hiding pages people do not interact with from their news feeds. By interact we mean ‘Like’ a post, click through on a link, visiting the page or sharing posts. For the majority of your fans who do not interact with your page frequently (the majority of them in most cases) they will not see your posts unless they go to your page directly. You can see this in effect by looking at the stats on each of your posts. As you can see from this post, only 498 people saw our post. It seems like a good number, but considering that is only 16% of the 2,933 people who ‘Like’ our page, it is a small percentage. To be able to get this post out to a bigger percentage of our fans we would have to pay to promote it by clicking the new Promote Button. We are yet to test the promoted post tool, although early criticism of the feature has already surfaced online with people complaining that the number of fans being reached is significantly lower than the estimated number Facebook gives you. 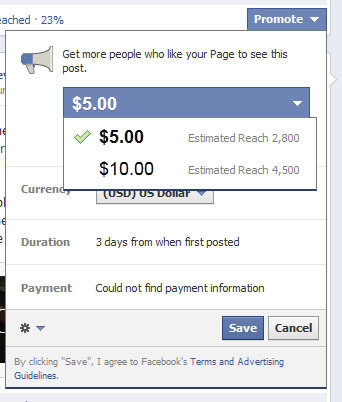 So what can you do to ensure your fans are seeing your posts without having to pay extra for the privilege?